No Excuse Slovenia is a youth organization in the public interest that strives for positive social change and personal growth of young people. With the help of non-formal education it encourages young people to social participation and activation of their peers. 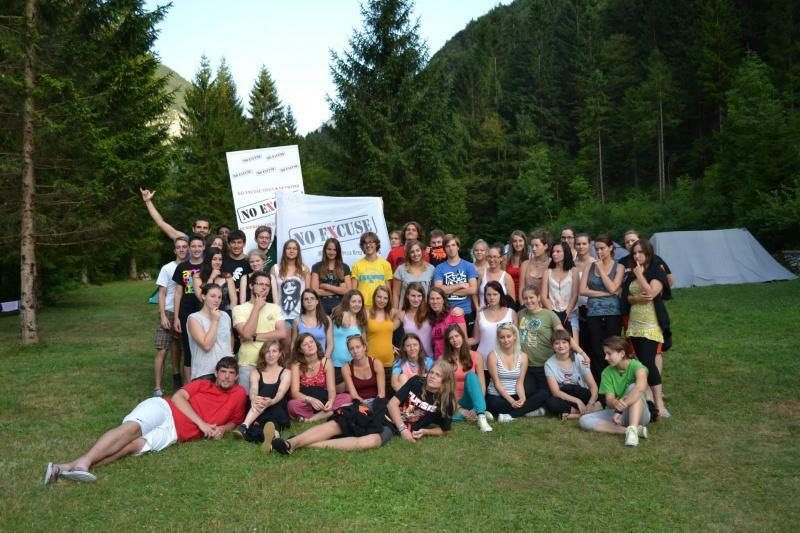 Young people in No Excuse Slovenia are spending their free time in a healthy way. They are raising awareness among other young people about actual topics and stimulating their critical thinking. The organization promotes and advocates through various projects for sustainable development, healthy lifestyle and active citizenship of young people. No Excuse is apolitical and a non-profit organization that operates independently from private financiers. No Excuse Slovenia was established on 7th July 2006 by Ana Lasić (ex Luin), Petra Fabiani (ex Merčun) and Jan Peloza. Since then, No Excuse Slovenia reached over 130 thousand young people in elementary and high schools in Slovenia (in groups up to 30 students) with their peer-to-peer workshops, mainly on the topics of healthy lifestyle and sustainable development. In this time, they have trained over 400 young people that participated in their "No Excuse Activists" programme that have lasted for seven seasons or 3,5 years and 1000 hours of trainings, lectures and field activities. No Excuse Slovenia co-established several international youth organizations, including the Alcohol Policy Youth Network, European Environmental and Health Youth Coalition, Sustainaware - Global Youth Partnership for Education on Sustainable Development, YU-SEE and the Tobacco Control Youth Network. European Health Forum Gastein shortlisted a joint project with APYN entitled Let it hAPYN for the European Health Award 2016. Slovenian Youth Manifesto on Tobacco - Ana Belac, Jan Peloza, Tomaž Čakš, 2007. Nonsenses of the Slovenian Tobacco Law - Jan Petrinja, Jan Peloza, 2008. Youth Coaching - Instructors in Youth Initiatives - Matej Cepin, Jan Peloza, Petra Pucelj Lukan, 2010. WTF is sustainable development?! - Jan Peloza, Blaž Gasparini, Jan Magdić, 2011. Sustainable Development and Youth Organizations - Snežana Džidić, Tea Jarc, Jerneja Modic, Jan Peloza, 2012. Training Youth Workers in Slovenia - Matej Cepin, Sabina Rupnik, Tadej Pugelj, Petra Pucelj Lukan, Jan Peloza, Tadeja Mesojedec, Peter Repnik, Irena Mrak Merhar, 2012. WTF is greenwashing?! - Jan Peloza, Julia Hentz, Tamara Mihalić, Jan Magdić, 2013. European Tobacco Youth Conference - Nick Schneider, Helena Koprivnikar, Jan Peloza, Veronika Jelen, Nina Rogelj, Filip Maslo, Nika Glavina, Patricia Krebelj, 2013. Triangle: how youth organizations can build and sustain a national coalition that works on alcohol policy - Sara Silvestre, Janpeloza, Sanela Talić, Daša Kokole, Matej Košir, 2014. Zee's apple factory (translated version from Siegel, Bettina Ellias) - Teja Boncelj Teraž, Tjaša Furlan, Saga Lucija Škerlep, Urška Erklavec, Jan Peloza, 2014. Sustainaware - Abishek Takore, Alfredo Redondo, Marina Mansilla Hermann, Jan Peloza, Tomaž Gorenc, 2015. Toolkit for Health Promoters (second edition) - Nina Milenković Kikelj, Irena Mrak Merhar, Jan Peloza, Rok Primožič, Tadej Pugelj, 2016. Midstream social marketing intervention to influence retailers' compliance with the minimum legal drinking age law - Tanja Kamin, Daša Kokole, 2016. "Zdrav ko vidra" - Toolkit for Health Promotion among Young People - Nina Milenkovič Kikelj, Adisa Dizdarević, 2016. Final publication of the Za zdravje mladih project (2nd Part) - Maja Drobne, Jan Peloza, Minela Jelečević 2016. Final publication of the Za zdravje mladih project (1st Part) - Daša Kokole, Jan Peloza, Luka Vitez 2016. Toolkit for Youth Workers on Cannabis Prevention (still in print) - Luka Vitez, 2017.